Mariwasa is embracing technology in the “Worldbex 2019” at the World Trade Center Convention in Pasay City recently. Mariwasa tiles with QR codes (left). 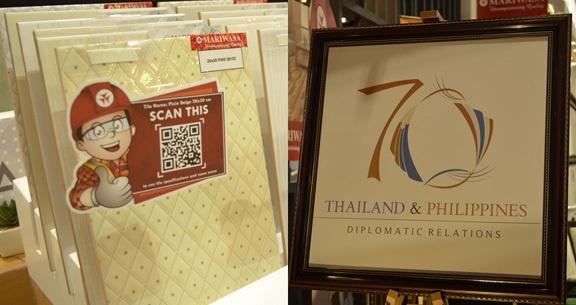 At right is the logo of a special edition Mariwasa tile, celebrating the 70th Anniversary of Diplomatic Relations between the Kingdom of Thailand and the Republic of the Philippines. The Royal Thai Embassy in Manila, in cooperation with Siam Cement Group (SCG) and Mariwasa, launched the logo of a special edition Mariwasa tile, celebrating the 70th Anniversary of Diplomatic Relations between the Kingdom of Thailand and the Republic of the Philippines. The special edition Mariwasa tile features a commemorative logo, designed for the occasion to represent the warm and close friendship between the two countries and peoples. The logo of the 70th Anniversary, designed by Jamille Aguilar, the third prize winner of Prince Mahidol Award Conference Art Contest 2016, is printed on the special edition tile. 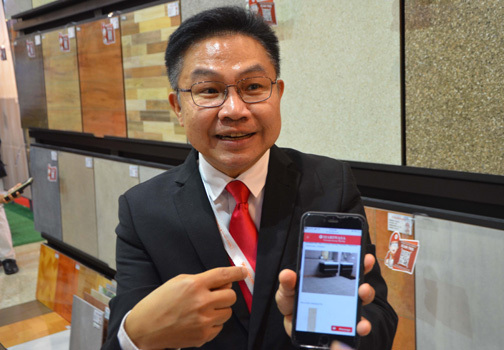 Aside from developing products that would leave a mark on their customers, Mariwasa has a plan to revamp its trend of automation and technology and upgrade its manufacturing line to come up with high-definition tiles, donning realistic textures and showcasing distinct designs. To this extent, they created the Mariwasa 4.0 to showcase their new set of products that embody “digital innovation and connectivity” that were made from a new trend of “automation and technology” to satisfy and surpass their customers’ expectations, according to Mariwasa President Jakkrit Suwansilp. Mariwasa 4.0 is its theme to this year’s WORLDBEX, where they launched 106 new tile designs that display timeless, elegant yet natural-looking creations that will cater to every buyer’s unique and preferred tastes. These designs were inspired by three different concepts—Revitality, Technique, and Wanderwall that Mariwasa’s designers created as they explored different places in the country and abroad to discover new ideas and trends, with an influence of contemporary features to incorporate in their tiles. Meanwhile, Mariwasa’s special edition tile has a logo that showcases an abstract design featuring iconic animals which are meaningful for the two countries. The National Fish, the Siamese Fighting Fish, is presented for Thailand, while the Philippines is represented by its National Bird, the Philippine Eagle. Both animals present an aura of beauty, grace, and courage that parallel one another. They are also decked in the respective colors of their National Flags. The wings of the eagle and the tail of the fish also act as hands reaching out to one another. The way they are positioned is in an endless loop, symbolizing unity, and the infinity of strong bond of friendship that is ongoing for 70 years and will continue to grow for the years to come. Under this logo, the Royal Thai Embassy in Manila, in cooperation with the Philippine partners and various Thai government agencies and private sector in the Philippines, will hold commemorative activities throughout the year to promote the bilateral relations in all dimensions and levels to celebrate this auspicious occasion. To bring convenience to their customers and to promote its image, Mariwasa also launched its new face last year with the name “TYLER,” the professional tile installer. Through him, customers can ask their questions and concerns about Mariwasa tiles and even how to properly install them. Tyler will also give suggestions and recommendations to help address their customers’ problems. “The primary difference of Mariwasa is we take priority on our after-sales service; this is also the reason why we launched Tyler the professional tile installer to communicate better to our customer’s concern. We created Tyler’s hotline and e-mail to answer customer’s queries immediately. To find out more about Mariwasa and the company’s products, customers can visit www.mariwasa.com or follow them on Facebook, Instagram, and Twitter. Customers may also reach the Tyler the “Professional Tile Installer” at Tyler@mariwasa.com or contact him at 717-6901 (loc. 2278) for any technical questions or concerns about Mariwasa’s products and tile installation. “This year we aim to focus more on providing overall solutions to our customer’s needs. Whether inserting more products in our portfolio or thinking ways on improving our after-sales services—at the end of the day we want to make our customer’s happy and satisfied from the product they bought from us,” said Suwansilp.